Successfully Added Guitar Tuner Clip (Mini 3-in-1 Edition) to your Shopping Cart. Our new mini-edition Guitar Tuner Clip is a compact, lightweight, digitally exact, easy to use 3 in 1 guitar tuner. It can help you tune your guitar or any other string instrument, be used as a metronome, or assist you as a tone generator. A suitable gift for every guitar and string instrument lover. This mini tuner has 6 buttons, 3 functions, 2 tuning mode, 1 bright blue back-lit LCD screen, and weighs only 41 grams (which is 1/2 the weight of your Zippo lighter). You can drop it in your pocket or inside any guitar case, and carry it to your studio, rehearsal, concert or anywhere you like. Tuner: Clip it to the headstock, or any other position you like. Choose either sound or vibration mode. 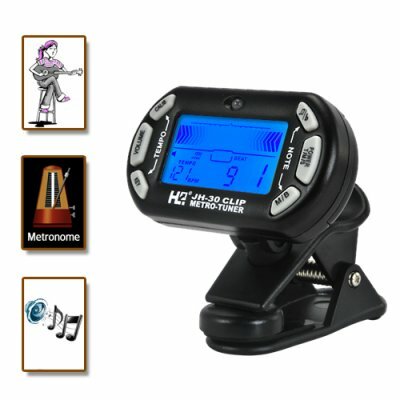 When a note is played, the tuner can automatically identify the note, and its back-lit LCD display will indicate by how much the note is in/out of tune. There is also an LED light that will turn red/green depends on whether the played note is in/out of tune. A great way to improve your ear tuning ability. Metronome: In metronome mode, you selet the tempo and rhythm of your music, it will make a beeping sound so you can play your music accordingly. Tone Generator: It can generate any note from any of the four major scales: C, F, Bb, Eb. You have more than one instrument, no worries, this is for more than just guitars! This great Music Gadget can also work for a violin, viola, cello, banjo, mandolin and most other string instruments. This item is a great choice for re-sellers and dropshippers to list on their webshops. With the normal retail price of similar items costing $40 or more, you can easily make a nice profit from selling these on your internet storefront while at the same time savings your own customers money. We are happy to introduce this new product to you with a 60-day no M.O.Q. window for you to try and buy yourself. Available in the Chinavasion warehouse right now, so click "add to cart" to order a sample today and we will ship it out to you tomorrow - guaranteed! Works for Classic, Acoustic or Electric guitars, but NOT Xbox !!! 60-day no M.O.Q. window for you to try and buy yourself. After 60-days this will become a minimum order quantity item - so don't delay in making your sample orders! I got a string instrument that I can't even tell the name, will this tuner work? As long as your instrument plays music, then yes, it should help tune your instrument. What is the vibration tuning mode good for? In any noisy place or if you having problem hearing sound coming from guitar, switch to the vibration tuning mode, so the tuner can detect the sound through vibration. You can tune you guitar based on the feedback from LCD screen and LED lights only.